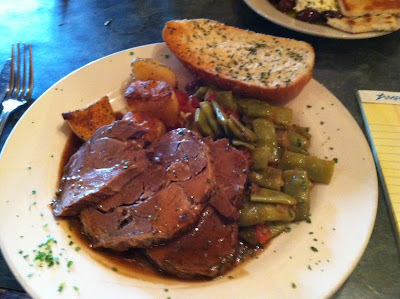 Arni Psito - roasted leg of lamb with Greek potatoes and green beans. Greek Isles is a lovely Greek restaurant located in Charlotte's historic South End. Lucky for me this is very close to my office. Last week I had a lunch meeting here and thoroughly enjoyed the above lamb special, offered every day during the week for $10.25. I opted to add a Greek salad also for $1.95 (not pictured), which was very good with high quality feta cheese. The lamb was juicy and covered in tasty tomato/onion gravy. Other lunch specials including braised lamb shank, oven roasted white fish and stuffed tomato and pepper are offered on various days of the week. The full lunch/dinner menu includes all of the traditional dips, the flaming cheese and traditional favorites like mousaka and pastitsio, among many other offerings. I like that this place is not loud and that the booths are roomy - great for actually talking with the person you are with! I look forward to returning to Greek Isles again soon.